The Acorelle Organic Bergamot Lotus Roll On Deodorant is enriched with natural alum stone, known for its regulating virtues that allows not to block the natural process of perspiration. The present active ferments fight against the bacteria causing the bad smells. Rich in floral water of the queen of the meadows, it soothes and respects the fragile skin of the armpits. Comfort and protection are the watchwords of this roll-on deodorant. It also seduces us with its refreshing scent with green notes. Formulated without synthetic aluminum salts and alcohol-free, the Acorelle Organic Bergamot Lotus Roll On Deodorant guarantees long-lasting effectiveness! 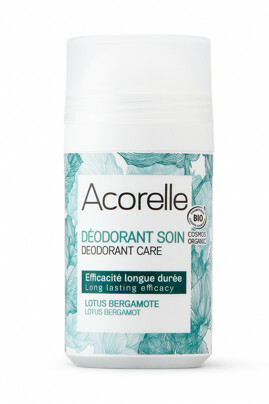 The Acorelle Organic Bergamot Lotus Roll On Deodorant gives a feeling of freshness! Daily, apply this deodorant care under the armpits. Do not use in case of damaged skin or recently depilated skin. An alum stone deodorant formulated with natural ingredients! AQUA (WATER), POTASSIUM ALUM, SPIRAEA ULMARIA FLOWER WATER *, SACCHAROMYCES FERMENT, PRUNUS AMYGDALUS DULCIS (SWEET ALMOND) OLEOSOMES, XANTHAN GUM, ALOE BARBADENSIS LEAF JUICE POWDER *, GLYCERIN, PERFUME (FRAGRANCE), GLUCONOLACTONE, SODIUM BICARBONATE, BENZYL ALCOHOL , DEHYDROACETIC ACID, SODIUM BENZOATE, POTASSIUM SORBATE, LINALOOL, LIMONENE, CITRONELLOL, CITRAL.